Drawing on examples from British world expressions of Christianity, this collection further greater understanding of religion as a critical element of modern children’s and young people’s history. It builds on emerging scholarship that challenges the view that religion had a solely negative impact on nineteenth- and twentieth-century children, or that ‘secularization’ is the only lens to apply to childhood and religion. Putting forth the argument that religion was an abiding influence among British world children throughout the nineteenth and most of the twentieth centuries, this volume places ‘religion’ at the center of analysis and discussion. At the same time, it positions the religious factor within a broader social and cultural framework. 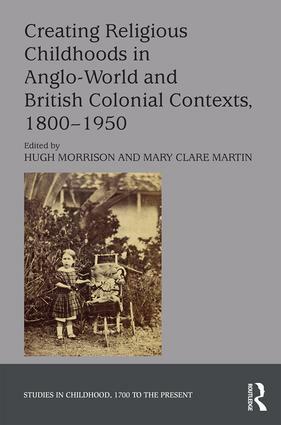 The essays focus on the historical contexts in which religion was formative for children in various ‘British’ settings denoted as ‘Anglo’ or ‘colonial’ during the nineteenth and early- to mid-twentieth centuries. These contexts include mission fields, churches, families, Sunday schools, camps, schools and youth movements. Together they are treated as ‘sites’ in which religion contributed to identity formation, albeit in different ways relating to such factors as gender, race, disability and denomination. The contributors develop this subject for childhoods that were experienced largely, but not exclusively, outside the ‘metropole’, in a diversity of geographical settings. By extending the geographic range, even within the British world, it provides a more rounded perspective on children’s global engagement with religion.